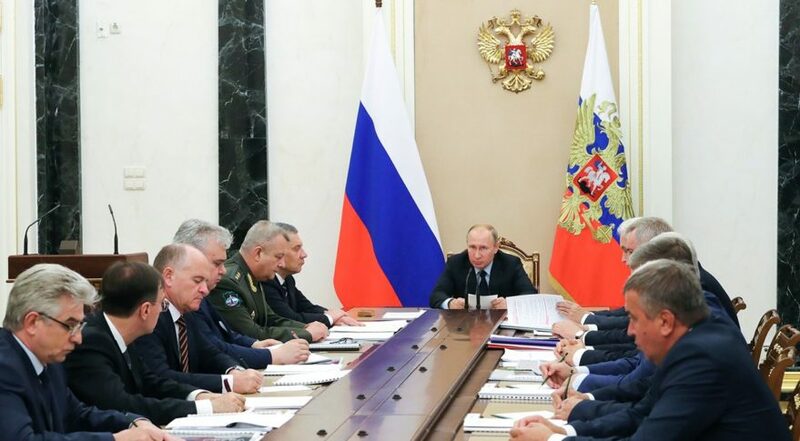 WASHINGTON — Russian President Vladimir Putin called on Roscosmos to meet deadlines for the nation’s future Angara, Soyuz-5 and “super-heavy class” rockets while fixing quality-control issues that have dogged Russian spacecraft and launch vehicles in recent years. According to the Kremlin’s published transcript of Putin’s remarks during a July 18 meeting with the state-run space corporation Roscosmos, Putin said it “is necessary to drastically improve the quality and reliability of space and launch vehicles” and to preserve Russia’s increasingly threatened leadership in space. “[F]or all the known problems, the missile and space industry has powerful technological and personnel potential, great engineers and scientific schools … Since the space industry is strategically important, please focus on the key tasks at hand,” he said. Russia’s Proton rocket has suffered more than half a dozen full or partial failures this decade, and was sidelined for much of 2016 and 2017 for an anomaly review and the subsequent unrelated discovery of incorrectly built engines. Proton’s launch troubles have caused International Launch Services, the U.S.-based commercial sales arm of rocket manufacturer Khrunichev, to lose business to European and American launch providers. This spring, Russian officials gave up on recovering the Angosat-1 satellite after the satellite began malfunctioning shortly following its December launch. The communications satellite, built for Angola, was a rare export for Russian satellite manufacturers. Putin selected Dmitry Rogozin, a former deputy prime minister barred by U.S. and EU sanctions from traveling to the West, this spring to lead Roscosmos. Last month Rogozin discussed retiring Proton to make way for the Angara family of rockets, saying production of both rockets would financially undo their manufacturer Khrunichev. Angara, Russia’s replacement for the Proton rocket that has been launching since the 1960s, “is scheduled for 2021,” Putin said, but needs a launch pad first. Russia is building an Angara launch pad at its Vostochny Cosmodrome, though the spaceport has suffered delays and cost overruns. Putin said Russia’s rocket and space industry “is currently overly reliant on budgetary funds,” and should “focus on ways to diversify its output.” He cited the defense sector as one such target for the diversification, however, not the commercial sector. “I believe the [Roscosmos] can and should ensure a steady flow of revenue from paid services rendered to other sectors of the economy in the sphere of information, navigation and communications. By doing so, we will direct federal budget funds toward the future goals of the space industry,” Putin said. Putin also mentioned a satellite program called Sphere that would consist of approximately 640 satellites launched in batches in 2022, 2024 and 2028. Sphere would contribute to space-based navigation, telecom and remote sensing, he said. Putin described Sphere as one of Roscosmos’ “commercially viable projects,” and urged its implementation, citing interest from domestic businesses and foreign partners.